My mom with her siblings and her parents. She is the little girl in the front/middle. First row left to right: Louise, My grandmother Heloise, my mom Aline (Murphy) Filliol, my grandmother Alexander, and John. 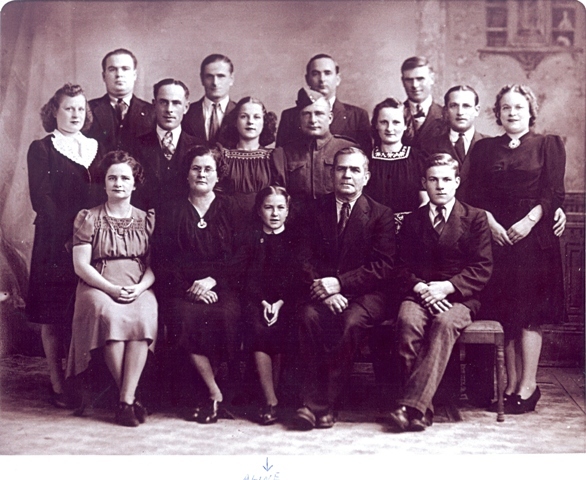 Second row: Ida, Joseph, Pat, Tom, twins Dolores & Dollard, and Yvonne. Third row: Leo, Dominic, Dave, and Sam. My mom had a sister named Agnes who died of diphtheria when she was three years old. My mother's maiden name is Murphy. The Murphy ancestors were soldiers under King James. 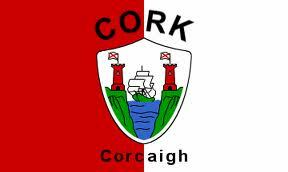 They were from Cork County, Ireland. 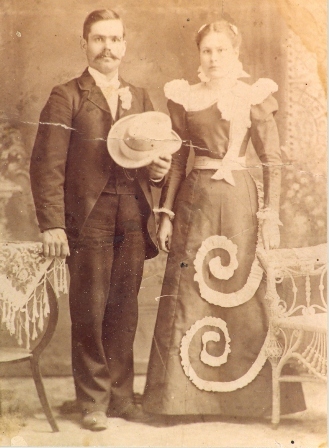 Her ancestors, between 1832 and 1848, immigrated from Ireland to Canada. They left Ireland because of the potato famine. These were the good times....and then the famine hit. They came to a camp in Grosses Ile, Quebec where Irish Potato famine immigrants were based before being received as Canadian citizens. My Mom visited there several years ago and said it was a very sad place. There were whole families who left Ireland, some died during the voyage, some contracted T.B. and died a short time after arriving in Canada. Some were teenagers who were sent by their parents to come to work in Canada. These teenagers were placed with farmers and even adopted by these families and that is the reason some of the Irish immigrants speak French. My mom enjoyed her visit to Grosses Iles but her heart was really sad and at one point tears just came pouring out. She was so troubled by the plight of these poor people. 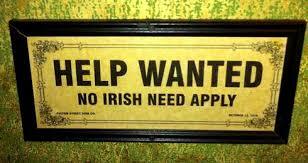 ....the largest immigration of the Irish to Canada occurred during the mid nineteenth century. 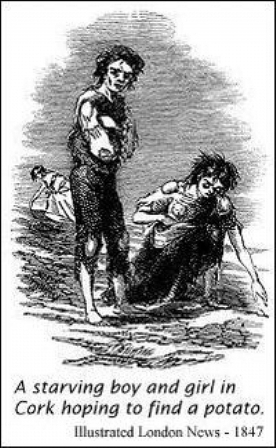 The Great Irish Potato Famine of 1847 was the cause of death, mainly from starvation, of over a million Irish. It was also the motivation behind the mass exodus of hundreds of thousands of Irish to North America. 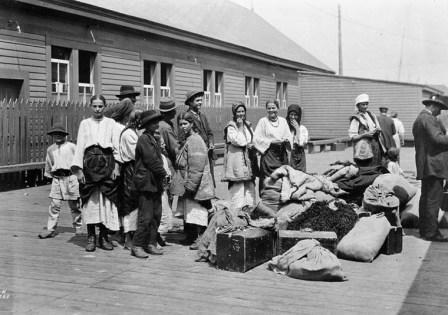 Because passage to Canada was less expensive than passage to the United States, Canada was the recipient of some of the most destitute and bereft Irish. Passage was difficult for those making the three thousand mile voyage from Ireland. Crammed into steerage for over six weeks, these "Coffin Ships" were a breeding ground for many diseases. 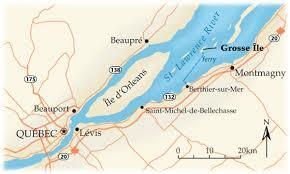 The primary destination for most of these ships was the port of Qu�bec and the mandatory stop at the quarantine island of Grosse Ile. By June of 1847, the port of Qu�bec became so overwhelmed, that dozens of ships carrying over 14,000 Irish queued for days to make landing. It is estimated that almost 5,000 Irish died on Grosse Ile and it is known to be the largest Irish burial ground exclusive of Ireland. Memorial cross for all the Irish immigrants that died on Grosse Ile. Between 1832 and 1848, emigrants poured out of Ireland. A deadly combination of an agricultural pathogen, and draconian colonial policy left millions starving. Great Britain operated Ireland under a �cottage� or �cottier� system. 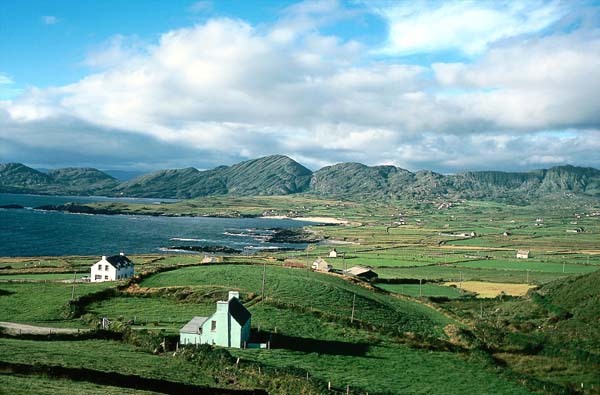 Irish tenants rented a plot of land in exchange for agricultural labor. The most fecund plots were reserved for British grain production. 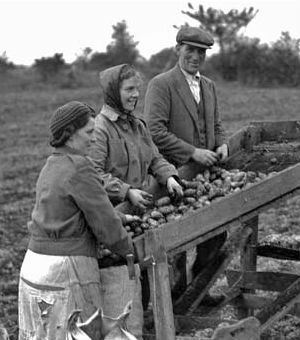 The Irish were often left with land that lacked adequate topsoil and key nutrients and supported only the monoculture of potatoes. 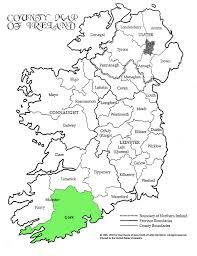 When Phytopthora infestans caused the repeated failure of the potato crop, millions of Irish were left with no food or resources. British land holdings continued to produce grains for export during the famine, but the Irish were not allowed access to this food. There is disagreement about whether these colonial policies were deliberately oppressive, or simply in stride with prevailing laissez-faire economic mores. The British government is purported to have viewed the famine as an opportunity to implement long-desired changes within Ireland � it was not a secret that they wished the Irish would leave Great Britain. The British in part subsidized the Irish exodus from Ireland by offering places on timber ships for the destitute � but these ships were meant for lumber, not people. These ill-equipped and dank ships were often turned away from major North American cities and diverted to Canada. As a British colony, Canada could not refuse British ships. The immigrants underwent a mandatory medical inspection when entering the country. Those who did not pass the inspection were held at Grosse Ile. Starved people in close quarters for a long boat ride over rough seas is a pathogen�s wildest fantasy. Many arrived suffering from cholera, dysentery, and typhus. However, Grosse Ile did not provide respite from the suffering. Patients were ushered off of boats and into a crisis situation. The Medical Commission of Canada reported miserable conditions on Grosse Ile in the summer of 1847: corpses remained in beds with living patients and vermin ate the dead laying on the beach. Inexperienced staff, improvised facilities, and ignorance of disease prevented effective management of quarantined individuals. Neither the British nor Canadian government took action to improve conditions on Grosse Ile. Canadian nationalists at the time believed that the Irish immigrants had habits that caused a predisposition to infection and sickness, and the well-documented anti-Irish sentiments in the United States were mirrored in Canada. Policies were in place that allowed disease and starvation to �naturally� decimate a disenfranchised population. Epidemics should be managed using empirically gathered evidence, not by prejudice against a group of people. 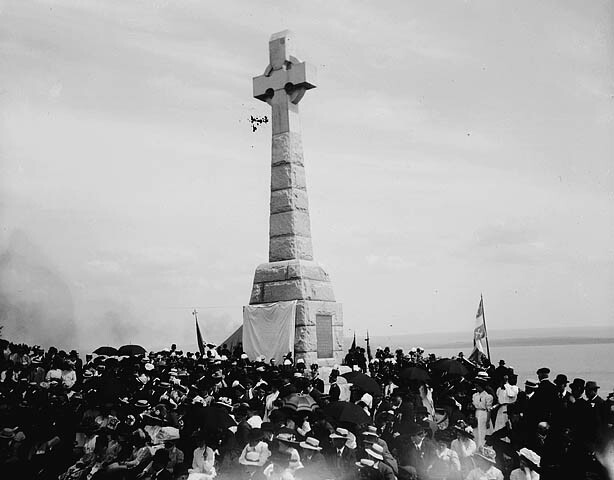 A large commemorative Celtic cross and a memorial listing the names of the dead stand on Grosse Ile. However, it�s easy to forget that Grosse Ile is the site of a mass grave when you�re participating in the nature walks and historical reenactments advertised on the Parks Canada website. Descriptions of the island�s tourism activities do not seem to reflect the somber atmosphere apropos of an island with such a morbid past. A mock medical exam and a tour of the mercury disinfection showers do not communicate the dismal conditions faced by quarantined immigrants.